Today’s post is for all you financial reporting executives out there: a special report on the software sector, and its efforts to prepare for the new revenue recognition standard that’s coming to a balance sheet near you by December. Efforts to prepare, or sometimes the lack thereof. The report, a joint project between Radical Compliance and Calcbench, examined the disclosures of more than 400 companies in the software sector: both the financial disclosures that suggest which firms might experience the most turbulence with the new standard; and the narrative disclosures those same companies make in the footnotes, to keep investors informed of how the new standard might affect the firms’ financial reporting. The bottom line, so to speak: we have numerous software firms that could see a material change to the nature and timing of their revenue disclosures, which are not saying much about how their efforts to implement the new standard are going. No wonder the Securities and Exchange Commission has been talking up a storm on the conference circuit, advising companies to disclose more about their prep work for the new standard. We began with Microsoft, which adopted the new revenue standard early and reported its new revenue figures on Aug. 2. Historically, Microsoft signed lots of long-term contracts with corporate customers for its Windows operating system, but could only recognize that revenue incrementally across the life of the contract. Future revenues (for, say, annual upgrades to Windows that had not yet happened) were bottled up on the balance sheet as deferred revenues. The new revenue recognition standard (ASC 606, Contracts With Customers) dispenses with that distinction for many types of software deals. Instead, the firms can recognize all the revenue immediately. So when software firms first adopt the standard, one action is to move deferred revenue off the balance sheet and turn it into a one-time surge of revenue on the income statement. Those are upward adjustments of 6.8 percent for 2016, and 7.3 percent for 2017. Microsoft isn’t “losing” money from the new revenue standard, but the numbers are shifting around to a material degree. That’s Microsoft, at least. So Calcbench and I wondered: What about all the other software firms with similar revenue patterns? The key determinant in all this is the amount of deferred revenue a software company lists on the liabilities section of the balance sheet—and more specifically, the ratio of deferred revenue to current liabilities. The higher that ratio is, the more the software firm depends on long-term contracts for revenue; and therefore, the more likely that firm is to experience a material effect when it finally implements the new revenue standard. We first looked at the average “DR/CL ratio” for the software sector for 2014-2016, and found that ratio to be 43 percent. Then we examined 406 companies that name Microsoft as a peer, and examined their DR/CL ratios individually as disclosed in their 2016 10-K reports. We found 27 companies with ratios that ranged from 80 to 100 percent, and another 11 with ratios above 100 percent. Let’s be clear: a high percentage of deferred revenue doesn’t automatically mean you will experience a material effect from the new revenue standard; only that you might be more likely than others. Microsoft reported a material change even though its ratios were 57 percent in 2015 and 69 percent for 2016. Other firms might suffer no material effects, even if their ratios are higher. The question of material impact really depends on each company and its specific business. 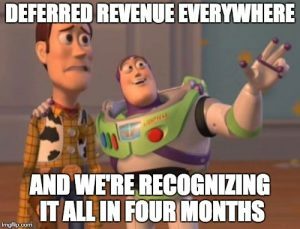 That brings us to the question of what companies have been saying so far about the new revenue standard, and what they haven’t determined yet. This is the part that financial analysts, investor advocates, and governance enthusiasts will want to hear, especially with the new standard looming right in front of us. We found that numerous software firms have quite high DR/CL ratios, yet still aren’t saying much about the new standard and its possible effects on their business. Falconstor Software, for example, has a DR/CL ratio of 117 percent, and said literally nothing in its 2016 disclosures about the new standard—not even a passing reference to it. Imperva, with a ratio of 94.5 percent, says it plans to implement the standard in January using the full retrospective approach (the more onerous of the two choices), but isn’t certain whether the change will be material. On the other hand, some firms gave extensive disclosure, such as Autodesk (602 words, no material effect, adopting in first-quarter 2018), ServiceNow (439 words, material effect, January adoption), and Hortonworks (still evaluating, but gave 1,081 words of discussion about it). And a special shout to Commvault Systems, a firm with $664 million in revenue that adopted the new standard in April—one of only a handful of firms adopting early. That takes some brass financial controls. We should also remember this study is a snapshot of disclosure in 2016 reports. Companies are disclosing more all the time, as implementation deadlines near. In a separate study we did looking at the 30 companies in the Dow Jones Industrial Average, 2014-2016, they did indeed disclose more and more over time. Financial compliance directors may want to study the findings to place your own company in the context of other firms: to see whether you, too, fit the profile of a company that might be more likely to experience material change, and to see what peers have been saying so far. Corporate compliance officers can skim the report so you’re conversant in this issue, which, rest assured, is landing on your accounting department like a brick right now. And ultimately this standard might have long-term effects that could give compliance officers cause for concern. For example, numerous software firms are likely to experience more volatility in their revenue from one quarter to the next (see Avid Technology’s latest statement for a good example). New volatility could affect sales executives’ compensation, and in turn affect your fraud risk. We’ll be writing more about revenue recognition in the future. For now, dig into the report and let us know what you think.